When Mum was sewing my matric dance dress in 1986 she bought an Elna sewing machine for the job. It had a great innings but eventually gave up the ghost. We sent it in for a quote to have it repaired and the cost of repair would have been more than the cost of other brands new machines. 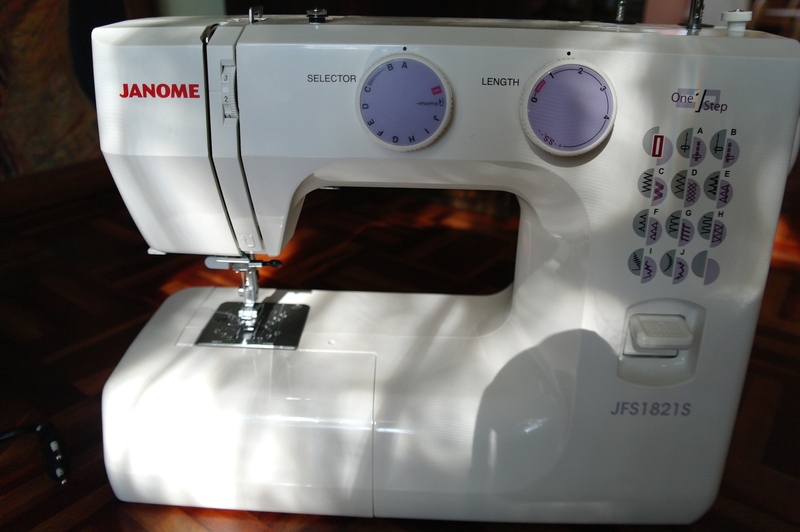 I got my Janome JFS1821S at Pick ‘n Pay about 18 months ago after much shopping around. Buying another Elna was out of our budget so I looked around and extensively researched the brands available in South Africa. I had to rule out the big brands such as Elna and Bernina on price. I was left with Empasil and Janome to choose between. My Mum has an Empasil and although it has not given many problems she said that she battles doing any heavy sewing on it and that it feels flimsy. Empasil are made in China. I found out that Janome now own Elna and that the machines are virtually identical. When I was shopping around I contacted the distributors of Janome and asked where I could look at a Janome as the ones in store were boxed and none on display, they told me to go to an Elna shop and look at a machine with the same specs as they are identical. The difference is in the price, if I remember correctly the Janome was about half the price of the Elna. Where a product is made is always an indication of quality to me, Janome are made in Thailand. The Elna 2000 which turned up it’s toes was apparently the last of the Elnas made in Switzerland before moving to the far East. The Janome JFS1821S which I chose was not the most basic model and cost a little more than the cheapest one but I wanted the overlocking stitch which I have used a lot. The machine feels wonderfully solid and has not given any problems at all. The machine has automatic 1 step buttonhole (which I have not tried yet), 21 stitch functions, some decorative stitches, the overlocking stitch and a big drawcard a 3 year guarantee. So far I have made Christmas stockings for the children, some kids clothes and last weekend braved curtain making for the 1st time ever. If for nothing else everyone should own a sewing machine for mending, so many things get thrown away when mending would give them a new lease on life. I am very happy with my choice of the Janome JFS1821S. My Mum visited recently and set the curtain making ball rolling, she was very impressed with the machine too. Update – 17/10/14 – It is a year and a half since I wrote this review and I am very happy to report that the machine has not given me a moment’s trouble, I use it very regularly and will be sewing nighties for my nieces this weekend. Update – June 2018 – Still no problems with the machine and it’s hardly ever not used long enough to pack away. thanks, i phone pick a pay in polokwane but they dont even have any sewing machines, in which town did you buy it. How do you gather fabric using your Janome, am struggling with it. Thanks, will definitely try that. Thanks, will definitely try that. I lost my instruction manual and I thought perhaps there’s an accessory that am supposed to use. Hello I have forgotten how to set the overlocking stitch on the JFS 1821S. Can you pls help. Hi … Do you know where can I download a copy of the Instruction Manual for the Janome JFS18215. Actually I want the whole book. But no worries I will contact the lady down at Pick n Pay Hyper where I bought it. She is very helpful so I am sure she will make a plan for me. Thanks for your kind reply. Glad to hear you happy with your Janome. I have not yet used mine. I found this review extremely Helpful. Please try this contact details for the Agent in Pretoria that may be able to assist you with the Manual. So as per PNP and Janome Distributors the JFS 1821S. is no longer available in SA. They now only keep the level RE 1712 and the 8870 models. Am not sure now which I should buy. The RE 1712 is currently on special at PNP for 1000.00. The RE 1712 also has the Overclocking stitch. Please advice which one I should buy. Sorry I don’t know either but would go for the 1712, the overlocking stitch is fantastic. I bought the RE 1712 with is almost the same as the JFS 1821 s. The difference is the one step button hole and more stitches. They has a JFS 1821 in stock at the Boksburg PnP , however the lady at the sewing center advised that the machine had been dropped during the renovation in the store and she had no guarantee that it would not be damaged. What a pity. Also the Lady at the Elna store confirmed what you said, Janome makes Elna, The Elna Sew and Fun/ Zebra is the same as the Janome Re1712 and sells at R1500 less . Thanks Again for your Blog. Hope to meet soon. Hello ladies, Zulie, I have the PDF version of the instruction manual. please let me have your email address so I may send to you. Oh my word it’s my lucky day! Is it for the JFS 1821S ? I contacted Janome and they gave me the manual. It is the Equivilent of your Machine. And when i compare to my book, it is the same. Thank you so very much. You are a star! I probably will find my book someday tucked away somewhere but I need it now. Hi Zulie pl be so kind as to forward the instruction manual to me too, I received mine whilst on holiday and left it at our holiday home, would be ever so grateful! Would you mind emailing it to me too? Can I ask that you also e-mail me the FinesseJFS1821S instruction manual. I am almost in tears with frustration. I can’t seem to download the manual anywhere without having to enter credit card detail. Now I am almost in tears with anticipation …. could I please ask if you could kindly send me a copy of the manual please. It would be highly appriciated. Or maybe anyone else. could I please ask if you could kindly send me a copy of the manual please. It would be highly appreciated. Or maybe anyone else. Wow ladies I have found your info so interesting…I did see the machines at PnP…I am wanting to buy one for one of my staff who has just started taking lessons and is making those traditional african outfits. He will be quite busy as I can see from the interest he is receiving. They have two to choose from a 21 function and a 52 function…of course you are so right the overlocking stitch will make life easy for him…but do you think this machine will last until he can afford to buy an industrial one. Hi Ladies, I want to take up sewing for beginners mostly I would like to make cushions, pillows, curtains and re-using fabric from soft to thick fabric. I need a good enough machine to take me from beginner to intermediate. I saw from the thread that you are in the East Rand are you in any sewing club or something similar I would like to join a group like that to share ideas and get motivation. My mum bought a overlocker for me in 1991and i got the sewing machine in 1990. I am NOW in the market to replace….only choice is Janome! Hi Antwa, have you bought a new machine yet? I am looking to get the janome 8077 or the janome JFS 1821S but not sure what to get? Hi Monique. Did u buy jsnome 8077. I need a review of that machine from a user please. Can anybody help. Hi! Could anyone please help me with a copy of model JFS 1821s…or please send my info on how to use automatic buttonhole??? Hi. Thank you so much for your blog. I made the decision to order my first sewing machine and I found all this info very helpful. I purchased a Janome 1712 and can not wait to start sewing when it gets delivered. lovely blog Sula and thank you – you are very patient. My last janome eventually gave up after 44yrs of wonderful service!! Just to old for spare parts. There was nothing I hadn’t done in the house, plus baby clothes, evening gowns and children’s clothes. I am now looking at getting the JFS181S. I think janome is a wonderful machine and in my price bracket I wont look further. I cannot live without a machine with a family plus the enjoyment of making things. Thank you so much for starting this wonderful thread…I am in the market for a sewing machine and you and the other guests have just made up my mind on which machine I will buy. I was at an Elna shop yesterday (20/08/16) but quickly walked out due to the prices on those machines! The sales assistant advised me to rather buy the machines from pick n pay instead of those from Game. Now I know its because she knows they are Janome and they are the same as the Elnas. Pick n Pay has the Janome JFS1821s and that is what I am going to get. So pleased that you found this post useful. Enjoy your new machine! I am starting build a sand bag house and need 38000 bags to be stitched and filled…so I did the costings and decided to get a few folk to stitch them for me…thanks to Sula and her blog I contacted the agent I think she is in Pretoria and she told me to go to the Hypermarket…have bought three machines and have three guys stitching away…they have never used a machine before so we gave them lessons and they are batting it out…having a competition to see who can get the most done…..talk about sturdy little beasts!!!! Wow.i am reading this late at night and cant wait for day time to purchase a sewing machine. I am only starting out but you ladies have inspiref me. I can a dress but lol cant stick no machine been so for 2weeks. So after this very usefull info i will confidently purchase a Jerome.thank you. Thank you very much, my husband managed to find the problem the little screw thingy hat hold the needle in had gone all scew (probably when the needle got stuck) so he sorted that out and bingo I am in business again. thanks for your reply. I found your blog post via Google. Thanks so much for taking the time to post the review… It’s really helpful! I’ve been searching to find the international model number of this machine so that I could find some more info. You mentioned that there’s an identical Elna machine… do you perhaps remember the model number of the Elna? Do you still use the machine, and how are you finding it? Or have you moved up to another machine that is better? Have you tried all the features and do they all work well? Is the build quality high? Have you stitched through tough fabrics like hemming jeans or sewing thick curtains? I tried to contact Janome-Emnic about the international model number but they didn’t respond as yet. Hi, sorry I’ve taken so long to reply our router was hit by lighting. Yes I am still using the same machine and I still love it. I have really put it through it’s paces sewing very thick heavy fabrics such as making a quilted picnic blanket with waterproof canvas which is very thick and heavy (and not fun to use). I even recently made a braai cover and lawnmower cover for my husband. Unfortunately I don’t know the international model number. I think this is the right machine for my family. Hi. I know this is really old but this website is the only lead I can find. I just bought this machine (JFS1821S) and it came with the wrong manual and it was the last model in store and I can’t get the right manual. Can’t find a PDF online either. Do you still have a pdf you could send of the manual? Hello Craig, I’m sorry I somehow missed replying to your comment. Are there particular pages which you would like me to scan for you? Thanks. Nevermind. Sat down and managed to work it all out. Three main issue was the automatic button hole but I figured it out. The other issue was were to oil but I just initially oiled all areas where moving parts moved against each other.